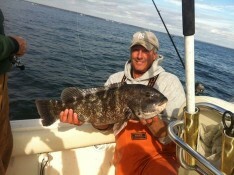 Free Fishing Reports > Northeast > New York > North Shore > Hank and Adam had a Slamming Day of Blackfishing!!! Hank and Adam had a Slamming Day of Blackfishing!!! 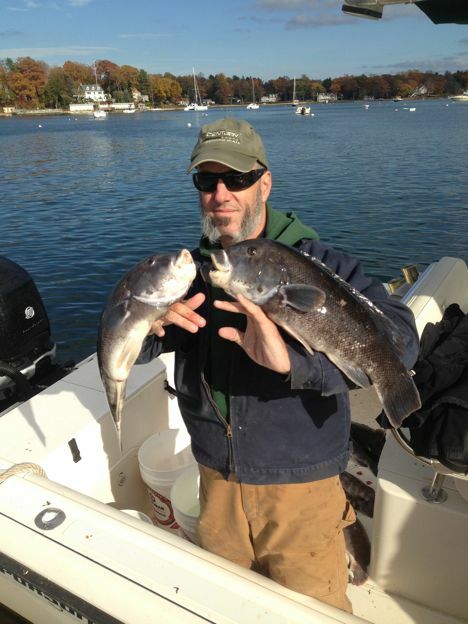 When the tide let up a bit, the crew went to deeper water to target some larger fish…and wham…the deep produced! fish after fish were coming up in the 5-8 lb. range, then the Capt. got slammed with what he has been waiting for…After a nice tug of war match, the Capt. pulled up, weighed and released a 10 lb. 3 oz. female to hopefully have another season to Breed !!! Way to go all..and great fishing and loads of fun with you all !!! Adam with some Tog from a day to remember !! !